Lifetime Movies has yet another heart-pounding thriller lined up for you this week. It’s a devastating time for a young mother when her little girl is kidnapped just before the mother’s wedding. But what if the man she wants to marry is actually her biggest and most dangerous enemy? Can she get her little girl back? Watch My Little Girl is Gone to find out! The thriller season is in full bloom on Lifetime Movies even as their latest offering My Little Girl is Gone premieres at 8:00 p.m. on Friday night, August 17, 2018. It’s another relentless ride into suspense in a genre that Lifetime Movies seems to have mastered. Everybody loves to watch their weekly weekend fast-paced thrillers, even if they are scared! Single mother Stephanie is delighted that she has a new man in her life and she is engaged to him. The threats from this unknown stalker continue and despite Stephanie’s best efforts, her sweet little daughter is taken. That’s when Stephanie finds out to her horror that the kidnapper is actually on her side and is trying to warn her of the biggest danger, Jameson himself! Is it true? Is the wonderful man that Stephanie plans to marry and make her daughter’s stepfather really the biggest danger to them both? The lead role of Stephanie is played by Sarah Lind, a Canadian actress best known for her roles in television series like Edgemont, Mentors and True Justice. Lind was born in Regina, Saskatchewan, Canada, and has acted in several movies such as Fetching Cody, Severed, A Simple Curve, Personal Effects, WolfCop, The Exorcism of Molly Hartley, and The Humanity Bureau. Lind has also acted in several TV series like Human Cargo, 5ive Days to Midnight, Reaper, Psych, Fargo, Taken, and Arctic Air. The film also stars Chrishell Hartley, who is professionally known as Chrishell Stause. Hartley is an American actress known for her TV roles in series like All My Children, Body of Proof, Days of Our Lives, Misguided, Mistresses, and The Young and the Restless. Philip Boyd plays the role of Henry in the movie. Boyd is an American actor and writer in Los Angeles, California, who can be seen currently in the TV series The Haves and the Have Nots. He has also acted in movies like The Dog Lover, In-Lawfully Yours, House of Deadly Sins, and First Man. Some of the TV series he has acted in during his long career are Step by Step, Cybill, Beverly Hills 90210, Felicity, ER, Star Trek: Enterprise, Days of Our Lives, and Feud. The all-important role of Jameson is played with bite and menace by Robb Derringer. Derringer has had a long career in which he has acted in films, TV series and also commercials. Some of the TV series he has appeared in are Beverly Hills 90210, CSI, CSI: Miami, NYPD Blue, The Lake, All My Children, The Young and the Restless, General Hospital, and Days of Our Lives. Derringer has also appeared in commercials for products and services like Ford Mustang, Bud Light, Valvoline, Honda, Maytag, Miracle Grow, Wrangler, and Verizon. Other actors who appear in My Little Girl is Gone include Braeden Carl, Dylan Raine Woods, Wolfgang Bodison, Jean St. James, and Betsy Randle. The actors are not very well known but suit the characters perfectly, and they have all done a great job bringing them alive on the screen. 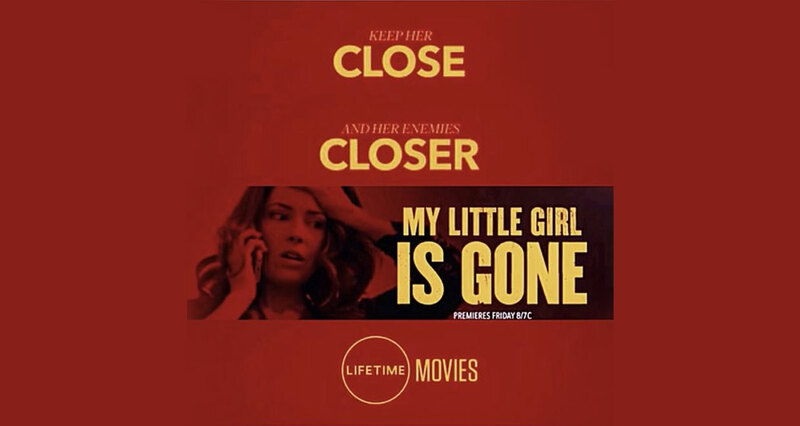 So, make sure you have plenty of free time on Friday, August 17, 2018, when My Little Girl is Gone plays out on your screens at 8:00 p.m. on Lifetime Movies. It’s going to be a thrill ride, so make sure you watch it!